2019 North Broughton Nomad: is a (6) six-day sea kayak adventure that takes you on a journey through the entire length of the Broughton Marine Park. Daily paddling takes in about 5-6 miles. The area is a blend of clusters of rain forested islands and scenic passages. 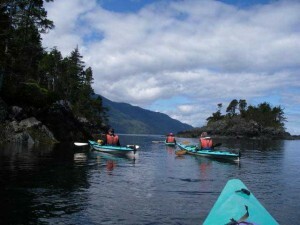 The kayaking is moderate in difficulty and challenging in the open water sections. This marine and land based wildlife provide different sighting everyday. The flora and fauna are unique to the West Coast. Camping is at established sites used and maintained by commercial outfitters. Highlights: learning to kayak with current, encountering a variety of marine mammals and wildlife in local habitats and rookeries, spontaneous surprises everyday on the water, forest camping, the sounds of whales, raptors and other critters, fresh food, support boat (lighten the load in the kayaks by take our gears from camp to camp), long sunsets, great photo opportunities and a chance to meet other keen adventurers. Arrival Day: Arrival in Port McNeill is usually late in the day because of the travel distance or the plane connections to Comox Valley Airport. Your guides will meet you at our shop at Suite B 455 Pioneer Drive. Port McNeill @ 8:00 pm the evening before your departure date. The meeting is scheduled to introduce you to your guides and do a gear check, fit a PFD, try a paddle and familiarize you with a sea kayak. We will also go over the route we will taking on the marine chart of the area. Meet at 8:30 am out front of the Tourist Information Centre Port McNeill, BC and leave the dock shortly after 8 am giving us lots of time to stop and catch a sighting of whales ( humpback, orcas, minke, sperm) in the waters cross. Around 10 am we arrive at our destination. 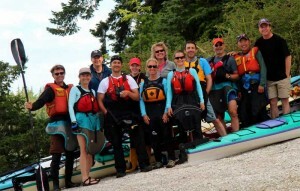 Catch a bit, stow gear and get on the water for a day of paddling. You never know what you are going to get the first day. In past trips we have had 80-100 + white-sided Dolphins put on a spectacular show for us. Or had eagle swoop down and snag a fish out of the water right in front of the kayaks. As the day progresses we catch lunch on a sheltered beach and drop-in on a local legend to round our day out. We return to our arrival point in time for a hour of relaxing before dinner. Salmon Dinner. Our first travelling day this morning. After a quick breakfast we set out to explore the passages and clusters of islands that make up the North Broughton Area. You better be ready for a great deal of wildlife sightings and quaint encounters with harbour seals, river otters and other critters who co-habitat together. Opportunities for great pictures and moments of inspiration are what this day is all about. We cover some 5-6 miles before we are in the area of our next camp. Camp actually remains hidden until you are right upon it. 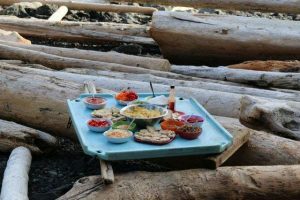 This afternoon we setup camp and enjoy happy hour around a small beach fire giving the guides time to prep dinner. It just be a night for star gazing. It does not get dark during the summers in the Broughton until 10 pm. We sometimes do a sunset paddle and return to a hot cup of hot chocolate and a warm sleeping bag. Today is our second traveling day. You will wait up to the sounds of birds and water fowl in front of camp. We will have the coffee going early this morning. Once underway we face a day of paddling shelters shorelines, large passages and finally open water with clusters of islets and islands within 1 km of one another. Often Kingfishers are chatty along our route and don’t be surprised if a harbour seal follows your kayak for most of the day. We take time to explore the visible marine life in the area, maybe even catch a fish along our travels. 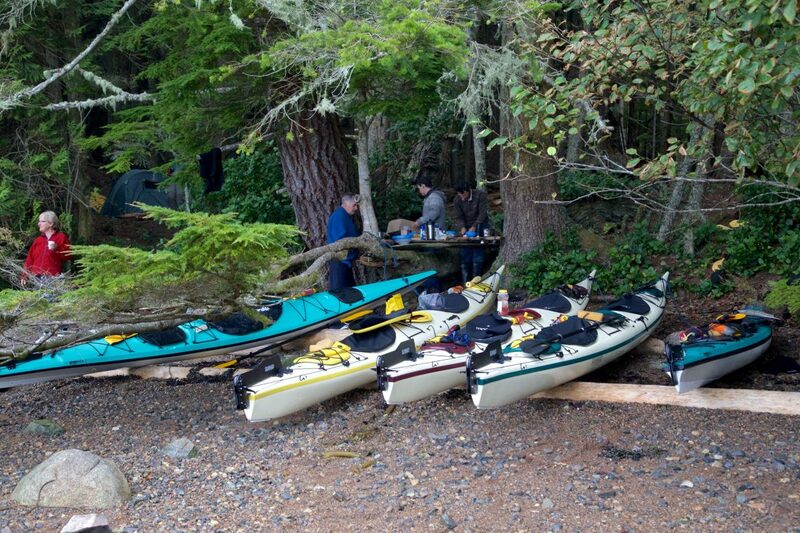 Expect to see eagles, sea lions and small harbour porpoise in the water we paddle today. Arrival at camp is late afternoon, just in time for a late lunch and the rest of afternoon for getting used to being on your own islet on the edge of Open water. You will sleep to the sounds of whales in the distance tonight. Mexican Dinner Night and a small fire to warm you spirit. Layover day with a morning paddle to visit a nearby seal sea lion rookery. Get some good pictures of wildlife today. The paddling is moderate but we might do a full day of exploring small cove and shallow spots. Catch lunch on a stretch of rock out of the wind but with a commanding visit of open water and where we are heading tomorrow. Don’t be surprised if the harbour seals follow you all the way back to camp. Afternoon activities will include a visit to native beaches and a place where we can stretch our legs in amongst some BIG RED CEDAR TREES. 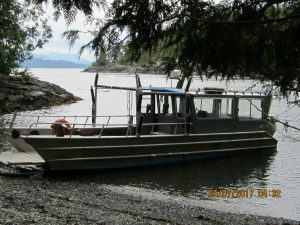 Many different passages will be explored with the chance of seeing bears on beaches, deer and otters foraging for food. Have a late happy hour and pasta dinner. End the day with a small beach fire and a chat about what we say today and what we will see tomorrow. A night for star gazing if you up for it. Early start to the day today! Longest paddle through scenic passages and crossing to the next camp. Day starts with a slow entry into a large passage with some waves and current to help us make the short crossing. The next group of islets we navigate present with rugged bluffs, deep clear water and a amazing among of marine life. After about an hour of paddling we enter into the waters where summer humpback whale forage and play. There is a large amount of feed for the humpbacks in this area, so stay alert. We will catch lunch in the islets where the seals and eagles hangout. By early afternoon we will be island hopping towards our next camp, whale watching and if your up for it a little fishing. Arrival at camp will be early. Late afternoon will be spend looking around camp and resting to see if we can catch a fun interaction with the eagles that nest close by. Early spaghetti dinner and some down time watching the sunset before bed. Our last morning could be one of the most exciting. Waters around our island basecamp are usually frequented by large whales, harbour seals, stellar sealions and dall’s propoises. A morning paddle is on the agenda after a pleasant breakfast to start this final day of paddling. Visit seal rookery and waters frequent by local wildlife. When we arrive back at camp, we can pack up our gear in preparation for the cruise back to our starting point. Lunch will be at camp or on the boat depending on if whales are moving in the direction we are going. Arrival in Port McNeill occurs between 3-3:30. We will have time to say goodbye and record your review of the trip for us. Note: This itinerary will be done in reverse if weather is a factor.